RP Photonics has a deep expertise on laser gain media, including the fundamental physics and their optimized application in lasers and amplifiers. Figure 1: Energy levels of Yb3+ ions in Yb:YAG, and the usual pump and laser transitions. The optical transitions take place between the 2F7/2 and the 2F5/2 Stark level manifolds. Optical transition cross sections are defined so that the rate of optical transitions (per active ion) starting from a certain electronic level is the transition cross section σ times the photon flux (i.e., the optical intensity divided by the photon energy). This concept often cannot be directly applied to optical transitions, e.g. in solid-state laser gain media (e.g. rare-earth-doped laser crystals and active fibers), because such media exhibit Stark level manifolds containing multiple electronic sublevels with slightly different energies. Here, optical transitions can occur between different combinations of sublevels in the two involved Stark level manifolds. A frequently encountered difficulty is that neither the exact energetic positions of the sublevels are known, nor the transition cross sections for all the combinations of different sublevels. These quantities can be difficult to measure, essentially because the different optical transitions are spectrally broadened by phonon-induced transitions within the Stark level manifolds, so that their contributions to the absorption and emission spectra overlap. Particularly in glass materials, the spectral broadening hides essentially all information on the different sublevels, whereas in some crystals (such as Yb:YAG) the absorption and emission spectra reveal clearly the contributions from different sublevels. The concept of effective transition cross sections is very useful, particularly for media with strong spectral broadening. Effective cross sections incorporate both the occupation probabilities for different sublevels of both involved Stark level manifolds and the transition cross sections for all pairs of sublevels. Their use is simple: the rate of optical transitions starting from a certain Stark level manifold is the effective transition cross section σ times the photon flux (i.e., the optical intensity divided by the photon energy). Effective cross sections are usually directly obtained from absorption and emission measurements, and the knowledge of sublevel positions and cross sections for the contributing transitions is not required. For example, the measured absorption spectrum of an electronically non-excited sample reveals the effective absorption cross sections for transitions from the ground-state manifold to higher-lying Stark level manifolds. As an example, Figure 2 shows effective cross sections of an ytterbium-doped fiber. Here, the strongest transition is that between the lowest-lying energy levels in both manifolds; it is seen as the “zero-phonon line” at ≈ 975 nm. The (weaker) absorption at shorter wavelengths (e.g. 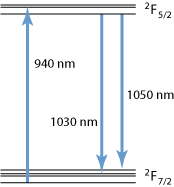 920 nm) is due to transitions to higher-lying sublevel in the upper manifold, which involves the emission of one or several phonons during subsequent thermalization. Similarly, the emission at longer wavelength (e.g. 1040 nm) is related to transitions to higher-lying levels of the ground-state manifold, and involves phonon emission during thermalization in the ground-state manifold. Effective cross sections are intrinsically temperature-dependent: temperature changes can affect not only the electronic sublevel positions, but also the relative occupation probabilities within the sublevels. The latter effect is often dominant. The lower the temperature, the more are the level populations concentrated on the lowest-lying sublevels. Higher temperatures allow for absorption at longer wavelengths (starting from higher-lying sublevels of the lower manifold) and for emission at shorter wavelength (starting from higher-lying sublevels of the higher manifold). 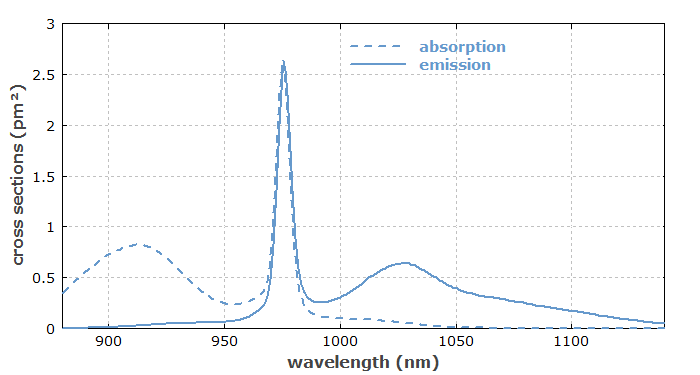 In the example of Figure 2, higher temperatures would increase the absorption tail around 1000–1050 nm as well as the emission tail at 900–950 nm, while somewhat reducing the height of the main peak at 975 nm. Einstein found that the transition cross section for some absorption process should be the same as that for stimulated emission on the same transition. That rule does not apply to effective cross sections in Stark level manifolds. There is a modified and more complicated rule resulting from McCumber theory. Effective cross sections can be used only when the level population within each Stark level manifold can be assumed to be in thermal equilibrium. In solid-state media, thermalization is provided by phonons on a time scale of picoseconds, so that this condition is in most practical cases very well fulfilled. Deviations can occur e.g. in regenerative amplifiers for ultrashort pulses, where an intense pulse can extract a significant amount of energy from the gain medium in a time which is too short to allow for thermalization within the pulse duration. 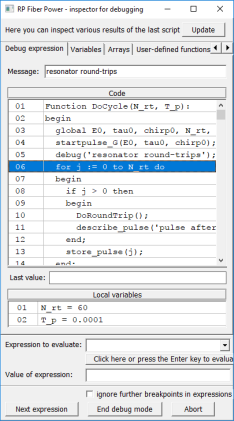 Effective transition cross sections are often used for rate equation modeling. The dynamic variables are then the population densities of the different Stark level manifolds, not distinguishing the sublevels.